I’m very much looking forward to 2010. The Quantifiable Edges Big Time Swing System was just released and feedback so far has been great. I’m excited to monitor the progress of that in the upcoming year. Additionally, I’ll have more announcements in the coming weeks about improvements and new features for the website. A safe and happy New Year to all. Thanks for reading, writing, and inspiring me throughout the year! So my son got Band Hero for Christmas and the Hannas now rock. Like a rock band, I decided Quantifiable Edges needed to release a “Greatest Hits”. The list below shows the most popular post (by number of hits) for each month of 2009. I’m calling it “Greatest Hits” because it is based on popularity. I don’t think it’s a “Best Of”. Many of my favorites were excluded and some of the ones below I didn’t think were all that great. So perhaps I’ll have some time to put together a “Best Of” later this week. 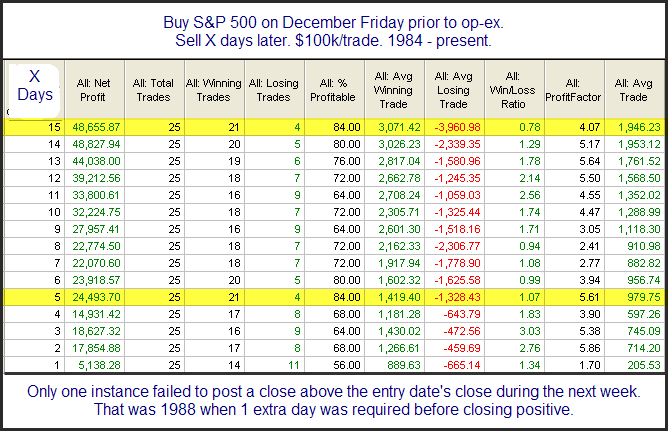 Nov – What A Strong Early Tick Has Meant In The Past – Perhaps I’ll need to post more intraday edges in 2010. After much hard work I am pleased to announce the release of the Quantifiable Edges Big Time Swing System. The QE Big Time Swing System simply combines a few of my favorite edges into a powerful new swing trading system. The system was designed to trade the major indices. It looks to take advantage of high probability, high expectancy moves that generally occur about once per month. 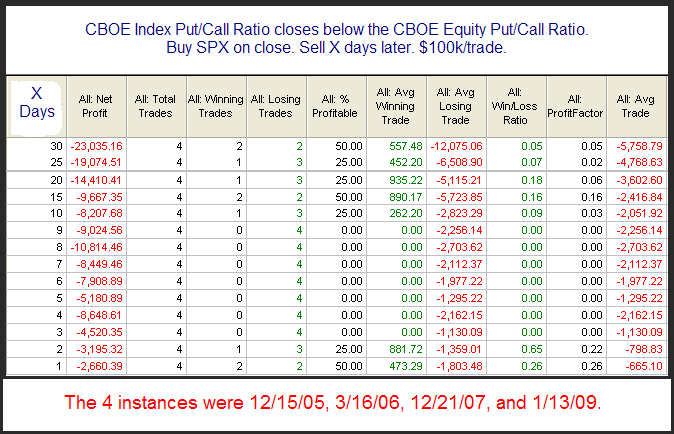 Using SPY over the last 16 years it has shown great consistency in both profits and frequency of opportunities. The system trades both long and short in both up and down markets. It is not a black box. It is completely open sourced and Traders may even elect to purchase the open code in Tradestation and Excel formats. While it’s completely open it still comes with a supporting web page for purchasers as well as a 2010 alert service at no extra cost. I’m extremely excited to be able to offer it at this time. I'm confident it will help some traders improve their results in 2010. For more information please visit the Quantifiable Edges Big Time Swing overview page. At Tuesday’s close we will enter the next strongly bullish seasonal period. Last year I showed the “Twas 3 Night’s Before Christmas” study. I have updated that study below. High Vol Rise on Op-ex Day - Good or Bad? Option expiration on Friday saw the market rise on exceptionally high volume. 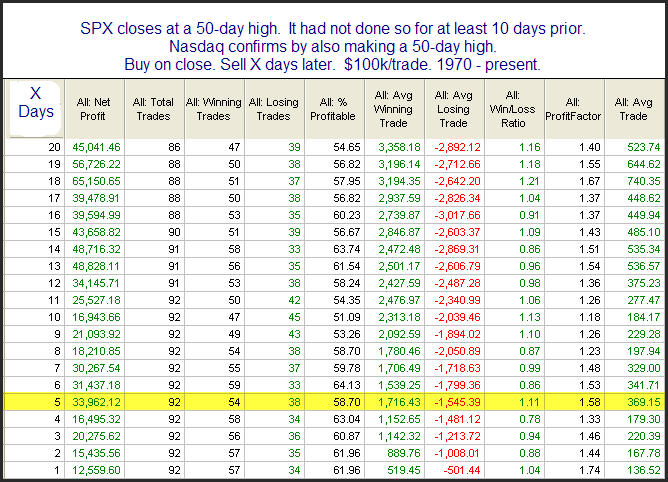 Over the last 13 years high volume rises on an up op-ex day have often led to a selloff. Could it be different this time? If it opens here then it already is. 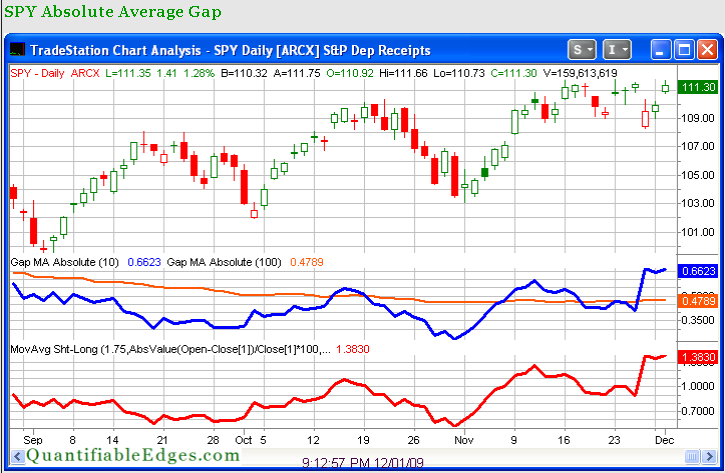 In no instance over the last 11 years did the market gap higher by as much as 0.5%. It did manage to do so on 12/21/98 – exactly 11 years ago. It also added to the gains and closed above the open that day. Overall implications appear short-term bearish though. The banks got hit hard on Tuesday with the BKX falling nearly 3%. 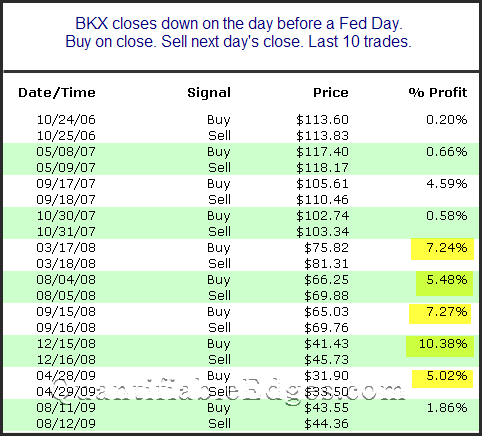 Below are results of the last 10 times the BKX dropped on the day before a Fed Day. Gains of 5% or more are highlighted in yellow. Nasdaq Confirms S&P New High - Does It Matter? The S&P and Nasdaq set new closing highs Monday. They were the 1st closing highs since late November. Typically when the SPX breaks out to a new closing high after not making one for at least a couple of weeks, it leads to short-term follow through. I looked at this a few different ways – using both SPY and SPX and considering 50 and 200 day highs. All the results came out very similar. Below is one example. I find it interesting that the while the breakout typically is accompanied by short-term follow through, it doesn’t carry over to the intermediate-term. One thing I’m neglecting to look at in the above test is the fact that the Nasdaq also broke to a new closing high. Many traders might see this as “confirmation” of the S&P’s closing breakout. I decided to check and see how much difference the Nasdaq confirmation made. These results are almost identical to the first test, though with a reduced sample size. I compared several ways and kept coming up with the same answer. The confirmation seems to be worthless. It neither greatly enhances nor greatly detracts from results. This holds true both short and intermediate-term. Frankly this was a bit surprising to me since we know a leading Nasdaq has been a good sign historically. This week is options expiration. Over the last 25 years December options expiration week has been the most consistently positive week of the year for the SPX. Below I’ve updated and expanded the study from last December that looked at this phenomenon. The bullish tendencies over the last 25 years have been exceptionally strong. And as we now see above, not only do you have strong indications that this upcoming week carries an upside edge, but also out as far as 3 weeks. Below is one study that appeared in the Quantifinder last night. 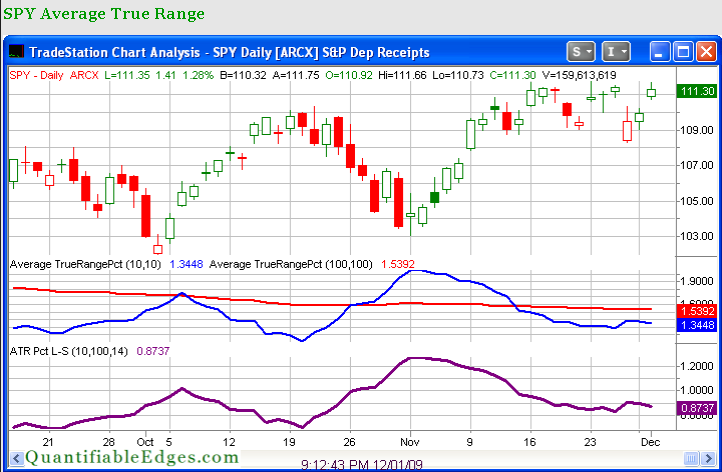 It suggests a bearish edge thanks primarily to the poor Nasdaq breadth on Thursday. I’ve updated the table from the 4/29/09 blog below. I should note that while there appears to be a bit of a bearish edge, this study is faced with some conflicting bullish ones that I’ve discussed over the last few days in the Subscriber Letter. The outlook isn’t completely cut and dry. I did think the study was worth noting and updating though. Does An Inside Day After An Outside Day Provide a Directional Edge? After posting an outside day on Friday, the SPY followed up with an inside day on Monday. This was also noted by Scott Andrews of Masterthegap.com last night. I’ve recently become acquainted with Scott’s work and find his application of statistical analysis to trade gap fills very interesting. I ran some tests to see if the outside day / inside day combination provided any edge over the next few days. The initial results looked like there was a possibility of a mild upside edge. Further investigation suggested the edge more likely is non-existent. Below is a profit curve that shows a 4-day exit strategy which should explain why I say this. 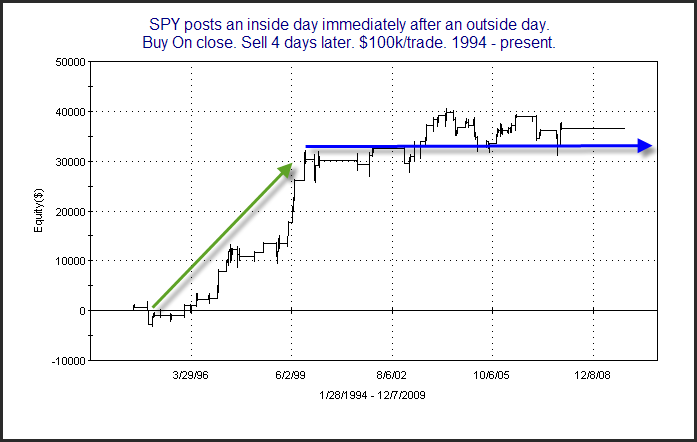 From this chart is appears that an edge MAY have been in place during the raging bull of the 1990’s. At that time just about any consolidation was followed by a strong move up. Since the end of 1999, though, the profit curve is a complete flatline. It appears that whatever edge there may have been back then is no longer in effect. Here's my take on using Optimal f (or any other position sizing formula for that matter). Optimal f may be the mathematically optimal size for a position IF the trades are managed in an optimal manner. For many people, positions of "optimal" size feel aggressive. While our perception is often that we have a large edge on a particular trade or strategy, the edge often isn't THAT great. In order to maintain your edge you need to be able to trade the strategy in an "optimal" manner. Whether the strategy is automated or discretionary doesn't matter. You need to be able to take entries when they trigger. You need to be able to take exits when they trigger. But just as important and sometimes most difficult is you also need to be able to SIT when there is neither an entry nor an exit triggering. The sitting can often be difficult when traders have what they perceive as a large position that they are managing. Many traders have a tendency to want to manage the trade more carefully with large positions. This may mean tightening stops sooner or taking partial profits a little quicker. Doing this "feels" good and it may get the trader to a breakeven level faster, but in the long run it will almost always either reduce or destroy the edge of the strategy. 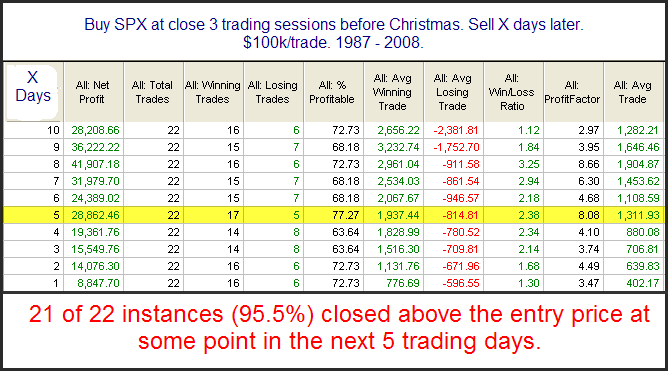 Tighter stops and quicker profit taking effectively means more losers and smaller winners. Few strategies can withstand more losers and smaller winners and still look good. Optimal f may be the mathematical optimal size, but in my view the optimal size is the closest you can get to Optimal f and still execute your strategies as they were designed - while keeping your sanity. So what should we do about it as traders? Two things come to mind – 1) Be more cognizant of dollar and other intramarket action. 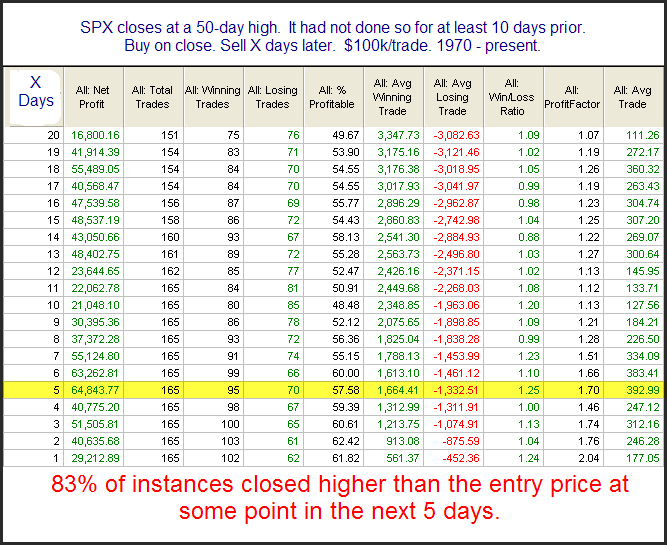 2) Perhaps don’t put quite as much weight on standard price, volume and breadth indicators as usual. The studies have done quite well as of late. Still, it may be worth trading with a bit more caution than usual until the stock market manages to decouple from the dollar a little bit.